Will the TEA Party Amount to More Than Complaining? Last weekend there was a big anti-tax protest in Washington, with other, smaller TEA parties held here and there across the country. I’ve been keeping one eye on this TEA Party phenomenon, but so far I haven’t seen much worth reporting here. These protesters seem largely content to complain about taxes, and largely unwilling to entertain resisting them except in hypothetical tricorner hat fantasies. I get the feeling that a lot of them are looking for a leader to tell them what to do. But the sorts of leaders they’re looking to for their rhetoric and ideas, the Glen Becks and Michelle Malkins and Rush Limbaughs and such, are by and large cowards for whom having a bunch of people complaining about the things they tell them to complain about is good enough. No way are they going to go out on a limb and begin resisting, though they may try to goad others into it if they don’t have to commit themselves. The original Boston Tea Party was a calculated act of law-breaking designed to send the British Empire a message it could not fail to comprehend. Making long-winded speeches, thumping impassioned chests and denouncing a government made up of people who have already written you off as unimportant, impotent, and no threat to their plans is a waste of time, energy, and oxygen. Both political parties have conspired through malice or incompetence to bring us to this state, yet still people look in vain to the system of party politics for salvation. The Founders were not so stupid as to place all their hopes on a corrupt system. When the accepted channels of politics and remonstrance failed, they burned the King’s tax stamps, dumped his tea, broke the windows of his tax collectors with rocks and bricks, smuggled forbidden goods, defied “his royal majesty” in hundreds of other ways, and dared him to do anything about it. Liberty is not free, nor is it without risk. All these tactics are still available to us today. Any inventive mind could think of many more effective means of getting across the idea that we insist upon our liberty in this modern era. It is not necessary to collect a crowd to do them, either. Defiance in action can be expressed individually in many ingenious ways. Then there’s this article on “What’s the Point of Demonstrating?” from The Independent Institute’s Beacon Blog . The article itself isn’t all that interesting, but look at the comments! Lots of people nibbling at the edges of tax resistance, trying out the arguments in its favor, showing every symptom of being resisters-to-be. So this may be a situation where all it takes is the right seed, some catalyst, and with surprising speed some new form of conservative tax resistance will begin to develop in parallel to the long-standing and largely left-oriented war tax resistance movement. The root of all war is profit and we will not allow the war profiteers to own our labor or steal the fruits of that labor to be used solely for their greed of power and money. We will boycott products and/or services from companies that profit from war and/or companies that support nations that make war on others. Indeed, I doubt most people will see this as a call to war tax resistance at all. An earlier draft of the declaration included the sentence: “We will not allow the fruits of our labor to be used by our governments to finance wars.” This was much less ambiguous. I’m sad to see the change. The problem with vague and ambiguous vows like these is that they are so difficult to precisely interpret that people end up interpreting them to require no action or change on their part. Have you vowed to boycott products and/or services from companies that support nations that make war on others? That would include every taxpaying company in the United States, you know. You are not seriously going to consider boycotting all of them, so you will look at whichever ones you already boycott or just happen not to frequent and check the box next to that solemn vow and be satisfied that you’re doing your part. And so your vow ends up meaning nothing at all. Have you vowed not to allow the war profiteers to own your labor or steal the fruits of that labor to be used solely for their greed of power and money? Better stop paying taxes, then. Oh, but they don’t use our taxes solely for their greed of power and money; they must have other reasons too. So I don’t really have to do anything different here, either. Check the box; the status quo wins again. In the second section of the second book of The Nicomachean Ethics , Aristotle first reiterates that his project is not to formulate a precise definition of virtue so much as to come up with a practical guide to practicing a virtuous life. In general, he feels, virtues are characterized by their “just enoughness” — as a mean between two opposing extremes of too-much and too-little. For example, between the extremes of rashness and cowardice is the virtue of courage. Like some philosophical Goldilocks, Aristotle samples various human virtues and finds them to be somewhere on a continuum between too much and too little. I can’t help but feel that there’s not much meat here. It seems to depend a little too much on linguistic conventions of how we describe various things. Do we really learn anything about virtue from this that we don’t already know just by being competent users of our language? We can describe courage on a continuum of sensitivity to fear, where at one extreme you’re too susceptible to fear, and at the other end you’re too insensible to it. But with other virtues, like health and beauty and wisdom, the endpoint of the continuum — the extreme — is by definition the perfection of the virtue. Can you be too healthy? too beautiful? too wise? Are we trying to stop the war or running a special olympics for protesters? We won’t stop the war if we won’t be honest with ourselves and if we keep making the same mistakes over and over again, congratulating ourselves all the while and pretending that our failures are successes. But, to paraphrase Donald Rumsfeld: you try to stop a war with the peace movement you have, not the peace movement you wish you had. Poet and tax resister Brenda Hillman considers six practical steps for the overwhelmed activist. Also: Stop the presses! Congress is considering budget cuts! But wait until you see the punchline. Václav Havel’s essay on “The Power of the Powerless” is a fascinating and surprising piece of work and I think it has useful lessons for us today. 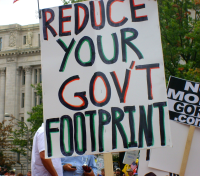 Why it is your duty to stop supporting the government → calls to action! → what makes a good call-to-action? A group of prominent peaceniks issue an appeal for people to urge somebody else to please do something to stop this darn war. Also: are you due a complete refund of your long-distance telephone excise tax? One New York company got a $400,000 refund, and that’s just the tip of the iceberg. On MLK Day, what say you we compare the resolution that launched the Montgomery Bus Boycott with the toothless anti-war appeal I discussed on Saturday. Also: the wonks gaze into their crystal balls and try to predict what will come of Dubya’s vague tax reform dreams — if nothing else, it’s a great excuse to shake down lobbyists. Finally — a call to action that’s actually a call to action: A review of “A Call to Resist the War in Iraq” in view of my recent criticisms of the “Appeal to Global Conscience” when contrasted with the resolution that launched the Montgomery Bus Boycott. If you take the best ideas from the various anti-war Calls, Appeals, and Resolutions that are floating around, and throw out all of the fluff, you might just come up with something useful. The Pledge of Resistance gets more specific, and more personal, and I approve. Also: more on the bizarre, regal, sedan-throne bubble-life of our god-emperor. It’s International Conscientious Objector Day. In Oakland there was a little rally and some folks plastered up a recruiting center. Also: I review the Declaration of Peace. Pitching war tax resistance effectively requires understanding the needs, fears, and values of frustrated anti-war activists. Fine tuning the war tax resistance message: since we have the facts on our side when it comes to the risk of jail time, why risk credibility over dubious factoids? Also: over two hundred people signed up for the “Don’t Buy Bush’s War” tax resistance pledge on-line yesterday. Wrapping up book two of the Nicomachean Ethics, Aristotle gives some rules of thumb that can help you find the narrow golden mean of virtue between the broad twin vices of excess and deficiency. Announcing the publication of “Rebecca Riots! : True Stories of the Transvestite Terrorists who Vexed Victoria.” Also: TEA Partiers and war tax resisters make their plans for tax day.